If your premises offers baby changing facilities, then nappy disposal systems are crucial. Those changing the nappies shouldn’t have to carry around soiled ones with them when they go, so commercial nappy bins should be in place. For environments like nurseries, pre-schools and daycare centres, there will likely be a lot of nappies to be changed, so the correctly-sized nappy bins are required in order to handle the usage. Envirotec Hygiene Services can provide nappy waste disposal services and nappy waste bins in a variety of sizes, with volumes ranging from 240 litres to 1,100 litres. We also offer a nappy collection service in combination with our commercial nappy disposal, whereby one of our team will empty your nappy bins and clean the now-empty bin with antibacterial cleansers. If you’re in need of means to contain the used nappies, we also offer yellow nappy sacks to house the waste in. For more information about our work as a nappy waste disposal company, simply get in touch with us today. We serve customers across Nottingham, Sheffield and Leeds, and there’s no better disposal company in Yorkshire and the East Midlands. Designed with robust performance in mind, the Nappease bin has a large 60 litre capacity and useful “easy to service” features. With a large, easy to use pedal and contemporary, easy to wipe down design the Nappease also offers end users a simple solution to dispose of nappy waste. The hands-free pedal bin is perfect for disposal of nappy waste bags but is also ideal for use anywhere fast and efficient waste disposal is required. 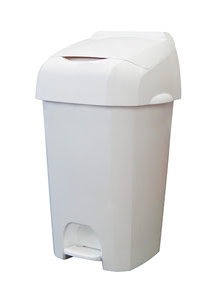 Constructed from a heavy duty, easy to clean polypropylene with reinforced edges, this is a heavy duty nappy waste bin for the busiest of commercial washroom environments. Made of high density and UV resistant HDPE with solid steel axle and rubber wheels.